At the Blind and Drapery Showroom, we have the largest selection of wooden drapery hardware available in the San Fernando Valley, the Conejo Valley and the Greater Los Angeles area. We feature wooden drapery rods and wooden drapery hardware from all of the major manufacturers including Hunter Douglas, Skandia, Kirsch and many more. 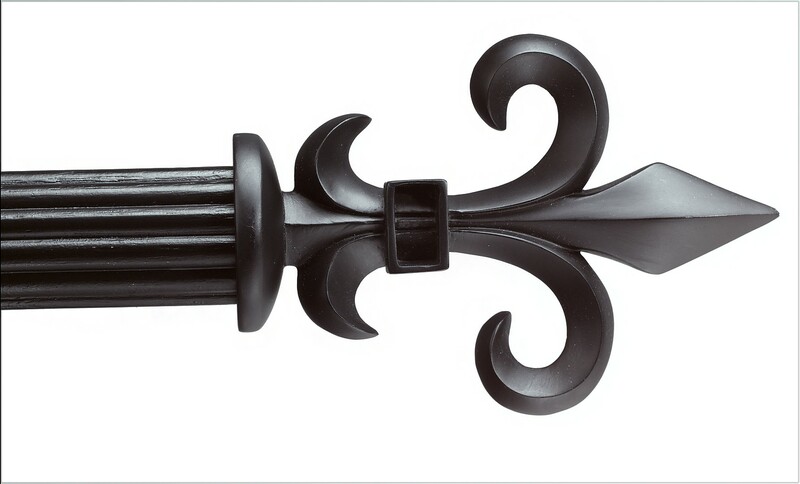 Wooden drapery hardware combines the ultimate in elegance & sophistication with the maximum in durability. Wood drapery hardware is available to match any decor – from formal to casual and from classic to contemporary. Highly ornate gold or walnut wood drapery hardware is suitable for even the most formal rooms. Sleek, subtle drapery rod & finial designs in understated black complement even the most modern decors. All wood drapery traverse rods are custom built to your exact specifications. You select style of the wood poles (drapery rods) as well as the “finials” (drapery rod decorative end pieces). Next you choose your wood color or finish. (Click here for sample wood drapery hardware finishes). Every style can be custom ordered in a virtually unlimited array of colors and finishes. Finally, you choose your style of wooden curtain rings. Below you will find just a small sample of the hundreds of wood drapery hardware styles we carry – each custom designed and manufactured according to your selection – to provide you with the ultimate in custom window treatment design.